Seing that several blogs and mass mailers are repeating this piece of “news”, I would like to emphasize that the article sensationalizes things without understanding the issue. The Indus-Sarasvati civilization (accepting that the word “civilization” connotes urbanism) emerges around 2600 BC, and those dates have not been challenged. 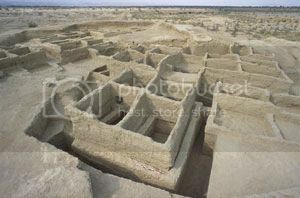 It has long been established — for at least 20 years — that its antecedents at Mehrgarh (Baluchistan) go back to the 8th millennium BCE, in the context of a Neolithic rural society, that is with just stone tools, yet a fairly advanced agricultural economy. The new development (“new” meaning some seven years) is the comparable antiquity of the earliest stages at Bhirrana (Haryana) excavated by the late L.S. Rao. This is also a rural stage, which probably straddles the Neolithic and the Chalcolithic; the pottery type is the Hakra ware, which has emerged at a few other sites of the Sarasvati basin in Haryana (such as Farmana) and Cholistan (in Pakistan). How such antecedents, whether in Baluchistan or in the Sarasvati region and probably with contributions from other regions, converged towards the Early Harappan stage (usually dated from 3800 BCE) is the very interesting question which should have been addressed instead. As too often, the media hype conceals the real issues. In any case the dates for the Indus cities — Mohenjo-daro, Harappa, Kalibangan or Dholavira — in their Mature urban stage will not change. They are firmly in the 3rd millennium BCE, as hundreds of carbon 14 and thermoluminescence have established.